I got a chance to sit down and chat with Andrew Hyde, of TechStars and founder of Startup Weekend and VC Wear, while attending the TechCrunch50 conference. Andrew and I both love startups. 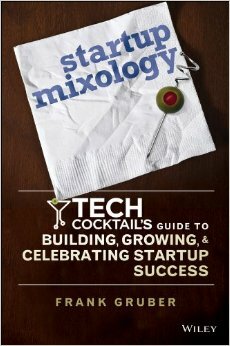 We recently talked about startups and even gave some advice that startups might find helpful. Check out episode 50 on SOMEWHAT FRANK an interview with Andrew Hyde (shown below) and help Andrew decide what to do for the next six months as he appears to be a crossroads. Andrew Hyde Interview from Frank Gruber on Vimeo. Yesterday, I was in New York City and got a chance to meet up with Meghan Asha, one of the co-founders of NonSociety, a new online media play that lifestreams niche verticals (fashion, style and tech). NonSociety is a group venture with Julia Allison and Kate Rambin. We took a walk in the park and got to chatting about startups, technology, electric cars, pets and even encountered a rather distracting making out session. Check out video episode 46 on SOMEWHAT FRANK with Meghan Asha (below). SOMEWHAT FRANK Meets NonSociety's Meghan Asha from Frank Gruber on Vimeo. 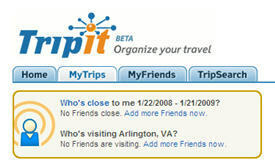 TripIt, the social travel management site which I reviewed previously, has received $5.1 million in Series B funding. The funding was provided by Sabre Holdings, O’Reilly AlphaTech Ventures and European Founders Fund. The series B round will be used to expand development, marketing and support for TripIt users. TripIt has been on a roll aggressively rolling out social and a mobile interface since launching at TechCrunch40 last year. WooMe, the online speed dating site that launched at TechCrunch40 and I previously reviewed, announced yesterday that they recieved another $3 million funding. The round was led by Mangrove Capital and included previous investor Atomico and a few others as well. There are a few things that are nearly guaranteed revenue generators on the Web and obviously online dating is one of them so I am not surprised to see WooMe attracting money like online daters. TripIt, a travel planner, organizer and social networking site previously reviewed on Somewhat Frank when it launched at TechCrunch40, has added some more social stickiness to the product by exposing when your contacts might have similar travel plans. Since TripIt already offers an number of useful general travel organization and collaboration utilities the new location-based social “closeness” alerts are aimed at helping travels keep better connected with others by making it easier to keep track of when someone may be in your town or your paths cross while on the road by automatically sending out notifications. WooMe, an online speed dating site that I previously covered, has officially opened up for business by launching into public beta today. I first met WooMe some of the WooMe team at TechCrunch40 in September. Then last month, WooMe launched into private alpha. I got a chance to take a look at it and was impressed with its addictive qualities. Facebook Launching Ads Outside The Network? Facebook has been blanketing the headlines for months now and it has heated up more with Mark Zuckerberg speaking at TechCrunch40 and the Web 2.0 Summit in the past few weeks. Mark recently hinted at an advertising platform launch coming soon and my friend Nick O'Neill of at AllFacebook has been reporting on for the past few weeks. Apparently the Facebook ad platform will not just focus on the Facebook space but will also go outside of the Facebook network and place advertisements on the Web which will place it in direct competition with Google Adsense and other similar services. Have you ever wanted to do speed dating but didn't want to actually attend an speed dating event? Now you can do it from the comfort of your home as WooMe is looking to take speed dating online. WooMe, a startup which I saw demo at TechCrunch40, has moved into a private alpha phase and I got a chance to check it out. Music Shake, a Korean born startup, captivated the audience at TechCrunch40 last week in San Francisco. Music Shake makes is easy to create music with its easy to use application. I gave Music Shake a whirl last night to if creating a song was as easy as it looked on the stage of TechCrunch40. 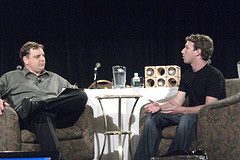 Mark Zuckerberg, founder and CEO of Facebook, sat down with TechCrunch co-editor Mike Arrington at the TechCrunch40 conference for a fireside chat. Mark talks about opening up the Facebook platform and announced the FBFUND is a $10 million grant fund from Facebook aimed at helping application developers. The grants range from $25K to $250K and Facebook takes no equity or debt. My email continues to overflow as I receive large amounts in several email accounts. I have written about email management a few times before so needless to say I was very excited to witness the private beta launch of Xobni at TechCrunch40. Xobni is more that just "inbox" spelled backwards as it offers a Microsoft Outlook plugin that helps to attack the email management problem and in doing so exposes the social network behind email. I installed Xobni and was quite impressed with its capabilities.